Recent biological studies have focused on understanding animal interactions and welfare. 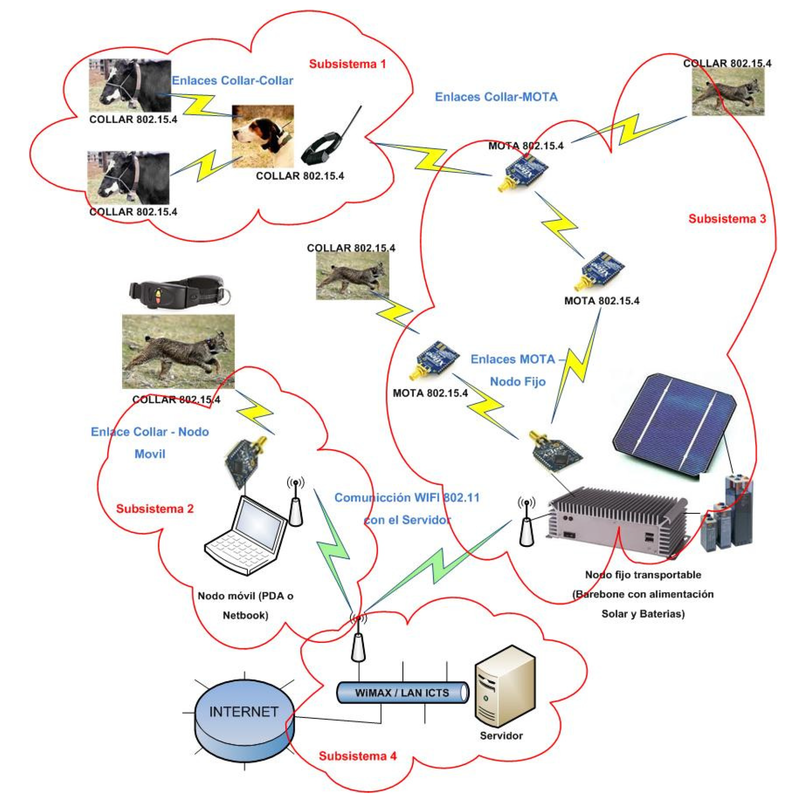 To help biologists to obtain animals’ behavior information, resources like wireless sensor networks are needed. Moreover, large amounts of obtained data have to be processed off-line in order to classify different behaviors. There are recent research projects focused on designing monitoring systems capable of measuring some animals’ parameters in order to recognize and monitor their gaits or behaviors. However, network unreliability and high power consumption have limited their applicability. In this work, we present an animal behavior recognition, classification and monitoring system based on a wireless sensor network and a smart collar device, provided with inertial sensors and an embedded multi-layer perceptron-based feed-forward neural network, to classify the different gaits or behaviors based on the collected information. In similar works, classification mechanisms are implemented in a server (or base station). The main novelty of this work is the full implementation of a reconfigurable neural network embedded into the animal’s collar, which allows a real-time behavior classification and enables its local storage in SD memory. Moreover, this approach reduces the amount of data transmitted to the base station (and its periodicity), achieving a significantly improving battery life. The system has been simulated and tested in a real scenario for three different horse gaits, using different heuristics and sensors to improve the accuracy of behavior recognition, achieving a maximum of 81%. Fig. 1. Network topology architecture. Fig. 3. BridgeBoard (left) and base station (right).